FOLLOWING the fire that destroyed the former St John’s residential home at Pound Lane in Downpatrick, police have arrested three juveniles in their mid teens on suspicion of arson with intent to endanger life. The juveniles have since been released pending further inquiries. The Pound Lane and St John’s Street area is now currently closed pending police and NI Fire and Rescue Service investigations and will remain closed for some time to come until the area is secured and save. St John’s House lies in ruins after a major fire on Sunday. Emergency services put out an alert to local residents that there may be burning asbestos in the building and police and firemen were wearing masks as a precaution. Residents have not been evacuated from their homes but have been advised to keep their windows and doors closed. Anyone with information on this fire has been asked to contact police at Downpatrick on 0845 600 8000. Information can also be passed anonymously to the independent charity Crimestoppers on 0800 555 111. SOUTH Down MP Margaret Ritchie has strongly condemned the fire which destroyed the former St John’s residential home in Downpatrick and has called on the Strategic Investment Board, Department of Health and Down District Council to ensure that the building is demolished, that the site including the old hospital is properly managed until sold, and adequate procedures be put in place for the economic development of the area. Ms Ritchie said: “The fire at the vacant St John’s Residential Home is an act of wrecklessness that will be condemned by many people throughout the community. The fire at this vacant site put people in the nearby housing estates at risk. The Fire Services team worked hard yesterday afternoon and evening to bring the fire under control and to contain the blaze. “In contrast with the fire, this site along with the old Downe hospital site has the potential to bring investment, job creation and economic opportunity to the Downpatrick area. It commands a pivotal location in Downpatrick. “This building now must be demolished; the site must be properly managed; and the site must bein a state of readiness for any potential owners so that this commanding site can be developed for the benefit of the local community in terms of job creation. Total destruction. The aftermath of the St John’s House fire in Downpatrick. South Down MLA Chris Hazzard has condemned the arsonists who destroyed the former residential home in Downpatrick. The Assemblyman visited the site on Sunday evening and was left “shocked” as smoke continued to billow high above the skyline. Mr Hazzard said: “In recent months fire-fighters have been called out to blazes at various locations around the old Downe site. It is a real shame that mindless destruction such as this continues to plague the local community and presents a serious menace to our local emergency services. Mr Hazzard described the scenes as “frenzied” and was keen to reassure local residents that all was being done to tackle the blaze. “Much of this site will now need to be totally demolished. I would call on the Health Minister Edwin Poots to give this situation his immediate attention in an effort to ensure the entire site is made safe and manageable. Down District SDLP Councillor Colin McGrath has condemned the recent spate of fires at the Old Downe Hospital Site in Downpatrick and called for those involved in the anti-social behaviour to stop. He said: ‘This is the fifth fire on this site in a few months and it is deplorable and I would ask those involved to stop these arson attacks. “It is unfair and upsetting for local residents to have such major incidents taking place on their doorstep. This is not a crime without cost either… it is a considerable drain on the resources of the fire service each time there is a fire, not least the danger presented to our local fire service personnel. “The South Eastern HSC Trust also has to bear a major cost in clearing up after each incident. This is money which could be better spent on frontline health services. I would urge the Trust to secure the site, as a matter of urgency. They must have a swift action plan in place to ensure that these buildings are demolished as quickly as possible in the interests of public safety. Downpatrick Sinn Fein Councillor Liam Johnston has condemed those responsible who set fire to St Johns home. Councillor Johnston said: “I was at the scene of the fire for most of the day and the fire and rescue service have to be commended for their efforts in tackling this blaze. “Fire crews from as far away as Belfast helped tackle this blaze. At one stage i witnessed the roof collapse and the fire service had a lucky escape. It has since been brought to my attention that there may have been asbestos in the building which is now airborne. 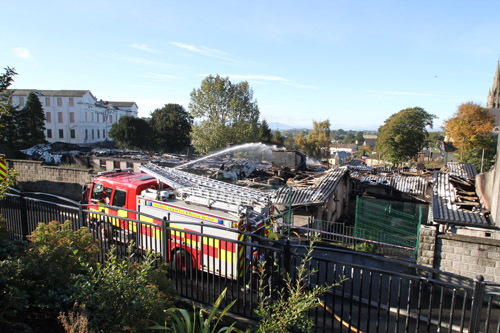 Down District Councillor Councillor Cadogan Enright has expressed his concerns for the centre of Downpatrick following the fire. 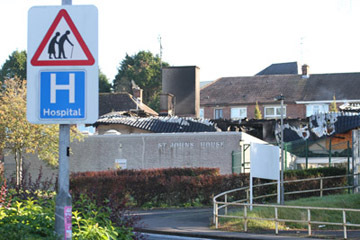 He said: “This fire at St John’s House was the sixth I have witnessed in the immediate vicinity of the old A&E in Downpatrick in about eight months on South Eastern HSC Trust property. Hopefully the arrests may result in an end to this problem that is adding to the dereliction at the centre of the town. “I was astonished there seemed to be no fire hydrants at the old hospital, and the water had to be brought up from Irish Street and St Dillons Avenue. This time the fire had been set more thoroughly and the fire swept out of control and filled the skies over Downpatrick with dark smoke. “When I think how hard people of all parties in Downpatrick have worked to develop the new Downshire Public Sector Campus, its a crying shame that the centre of the town has to suffer in this way. When prospective public sector tenants drive up to the new Campus, they must pass a swathe of dereliction stretching from John Street and St Patrick’s Avenue all the way over to the Ardglass Road.